YesMyBride is such a team made up of experienced workers and professional bridal dress designers. These designers mostly come from France and US, all of them have more than 5 years’ experience and different designer has different expertise of dresses. Some designers have ever worked with famous brands for wedding dresses, couture with exquisite craftsmanship. Code 23138 Stunning look in this champagne drop waist wedding dress, classical strapless bodice make up the design with sweetheart neckline, asymmetrical pleats surrounded on dropped bodice. At the natural waist, black satin ribbon combed with shinning crystal rhinestone. Skirt is layers ruffled look giving luxury scene, back lace up, chapel train. Inside satin. Code 1F063 $139.00 It is so beautiful apple green colored chiffon short A-line bridesmaid dress, it has strapless sweetheart neck, front and back with pleats and ruching to make you amazed at the workers professional work. Waist flower with diamond make the whole dress highlighting and beauty enchanting! Code 2I189 Asymmetrical ruffled slit skirt, ivory strapless custom wedding dress. Pleated sweetheart neckline features one side adorned with beaded ruffles, bias pleated dropped waist accented with one side beaded embellishment. 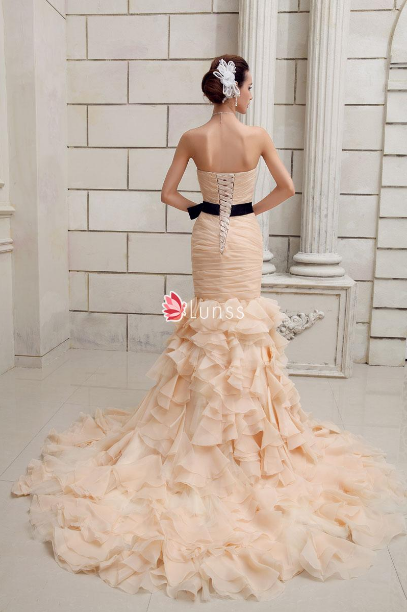 Ball gown skirt offers luxury cascading ruffles and open slit adding drama, v back. Code 1G025 $149.00 Look pretty with this daffodil sheath chiffon evening dress. One shoulder embellished with lace applique for an asymmetric neckline. One piece drapes from one side of top breast to back hitting another hips with beautiful pleats. The whole dress make you like a ambassador bringing elegance and kindness. Add to Favorites Ask a Question Email to a Friend Code 1I175 $149.00 Beautiful yellow chiffon short bridesmaid dress. Twisted spaghetti strap bodice offers deep v-neckline, eye-catching 3D flower adorn shirred ribbon at waist, asymmetrical draped skirt flows elegantly. Please leave a note about the neckline style in the checkout page, thank you! YesMyBride, as the leader of custom-made dresses field, we offer the best selection of custom wedding dresses, custom bridesmaid dresses, custom prom dresses, and other special occasion dresses that fit your figure and style perfectly.